I've been intrigued by Aurelia Probiotic Skincare for a while now, ever since Jen mentioned the cleanser on her blog and I do trust her opinion. So when I got the chance to try a few of their products, I jumped at the chance, but first here's a little background information. 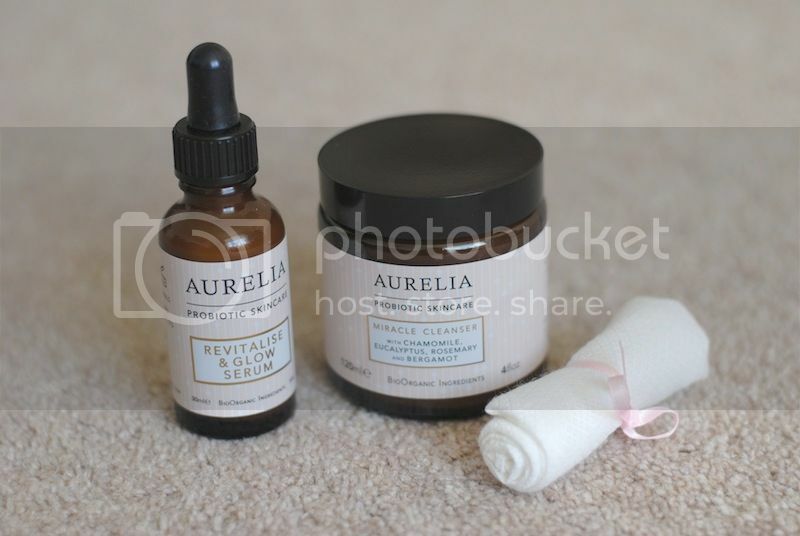 Aurelia skincare is based on the powder of probiotics and the science behind it. The products are scientifically proven to help manage the level of inflammation within the skin, which is the main cause of the skin ageing. They are not only extremely high in anti-oxidants to combat the damaging free radicals, they contain Aurelia's Probiotic technology and repair complex. Cytokines play a major role in managing the inflammation of the skin. They are the molecules which signal to our body to active or suppress an inflammatory response. Probiotics help prevent the skin ageing, although it will eventually happen to us all. It's suitable for all skin types and ages too. To learn more about the science behind the technology, they have a FAQ on their website here. Back to the products, I've been using the Miracle Cleanser* and Revitalise & Glow Serum* every day and by god, my skin has been loving it. The Miracle Cleanser is a strange one, it almost feels like a moisturiser as it's very creamy and just glides onto the skin. I have been applying it to dry skin, massaging it all over my face, whilst it lifts all the impurities and make-up off my skin. It uses the same probiotic technology, as it's in all of the products, to hydrate and soothe dull skin. It's fragranced with an uplifting blend of essential oils including eucalyptus, chamomile, rosemary and bergamot. It's £34 for 120ml, which may seem a little bit expensive, however a little goes a long way and your skin will thank you. I have been applying a lot of the Revitalise & Glow Serum, a few drops at any possible time. A serum is a concentrated mixture of skincare actives in a lightweight formula, that sink into your skin fast and target your complexions specific needs. Packed with the probiotic technology, it's combined with Bio Organic botanicals and flower essences to hydrate and soothe dull and dehydrated skin. I have been using morning and night after cleansing and before applying my moisturiser. However, on the days I haven't been wearing any make-up, throughout the day I have been applying a few more drops. In the few weeks I have been using it, I have seen a big difference from the serum. Overall my skin looks a lot brighter and the texture is smoother. I know that it is these products which have worked as these are the only new products I have added into my routine, so for that to happen in such a short amount of time is impressive. It's £47 for 30ml, so if you're looking for some brilliant results, it's worth the investment. The products are available to buy on their website, online at Net-A-Porter and in store at Liberty in London.